[By Nick] Did you know June is Nation Dairy Alternative Month? Yeah I had no idea up until a couple of days ago. What better way to celebrate this random holiday then by trying out a dairy free treat? Rice milk has been one of the only ice cream alternatives I’ve yet to try. Blame it on lack of opportunities or skepticism on my part but it just never seemed all that appealing to me. 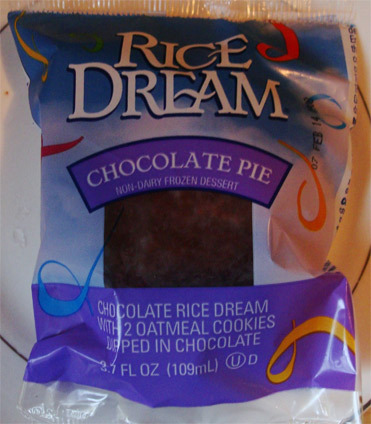 That’s all about to change because wandering through a health food store lead me to finding these Rice Dream Frozen Chocolate Pies. I’m not really a fan of pies so I was about to put them back until I read their description. 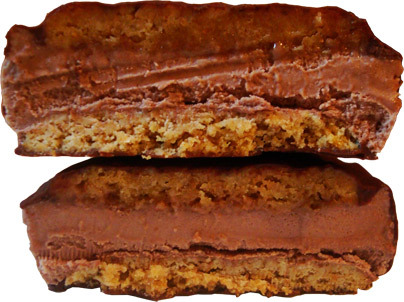 These are made up of chocolate rice dream that is sandwiched between two oatmeal cookies and then dipped in chocolate. Is it just me or does this sound like the dairy-free* version of the infamous west coast treat, the It’s-It? Being that I reside on the east coast, I’ve never tried an original It’s It before (send me some ;]), so I guess these will have to do. 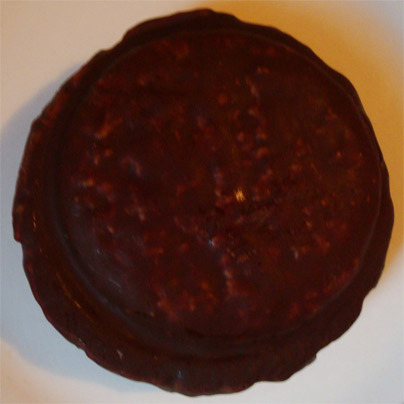 Out of the package, it looks like a hockey puck. Unlike a hockey puck though, it’s a lot softer than I had imagined. For some reason I was thinking the shell would’ve made it more solid but it was actually kind of squishy. Cutting it in half only confirms my suspicions of it being soft. There was little resistance and I didn’t hear any cracking like I did with the Klondike bar. The cross section does look pretty appealing though so I’ll give it points on that. Biting in, I’m greeted by an oatmeal flavor but sadly that’s about it. The chocolate flavor in the shell and in the ice cream is pretty mute. Even when tried on its own, the chocolate flavor just seems dull and something feels off. It’s as if the chocolate went on vacation and forgot to tell the oatmeal cookies. Looking over the ingredients, there no real presence of any sweetening agent in either chocolate application so this could be the reason why I feel like something is missing. As I suspected, the shell added no crunch and gave way easily to the soft oatmeal cookies. If only the shell had some crunch it would’ve served a purpose but I literally can’t see why they even dipped it in this uninspired chocolate. On a positive note, the rice ice cream was a lot creamier than I thought it would be. I would say the consistency was on par with most ice cream albeit lower end ones. Actually, if I didn’t know it wasn’t ice cream, I don’t think I would’ve known otherwise. That could be because it was sandwiched between two cookies so I’m curious how it’ll be coming from a pint. Texture doesn’t mean a thing when you’re lacking in the flavor department though. The only other positive I got from this treat is that the oatmeal cookies are pretty good. They are as soft as a freshly baked cookie but still manage to have a nice chew them. They could’ve also used a bit of sugar and spice but that wouldn’t be enough of a factor to save this novelty. If Meat Loaf thinks “two out of three ain’t bad”, well one out of three isn’t good. I know it sounds like I hated this treat but I actually kind of enjoyed it. Being that I’m a lover of all things oatmeal, this was a nice change of pace. As a product claiming to be chocolate though this is a major failure. At least this was a semi-positive step into the rice ice cream world. Now all I want to do is try a real It’s It (Seriously someone send me some!). Buy This Brand Again? I’d definitely give other varieties of these pies and their pints a chance. wow you weren't kidding about no real sweetening agents, I saw malted corn and barley way down on the ingredient list. These aren't any "healthier" than an it's-it. I would rather just risk it with a lactaid. Hopefully I have better luck with the other kinds. It really makes me want to try a normal it's-it a lot more now. It's It's website says it will overnight to continental US. Probably not cheap but you could do birthday hints to friends. Yeah the shipping is ridiculous. It's $67 just for one case of them. I wish they made a sampler pack and then I'd consider it or maybe offer their stuff on icecreamsource.com so I could just order one of what I want with other products as well. I'd be able to justify the shipping costs if that was possible.